New Year's celebrations are often overhyped, and, let's be honest, a little bit of a let-down. If this has been your experience in the past then this year why not do something a bit different? Menesjärvi is one of the most remote wilderness regions that we offer, allowing you to quite literally escape the crowds. 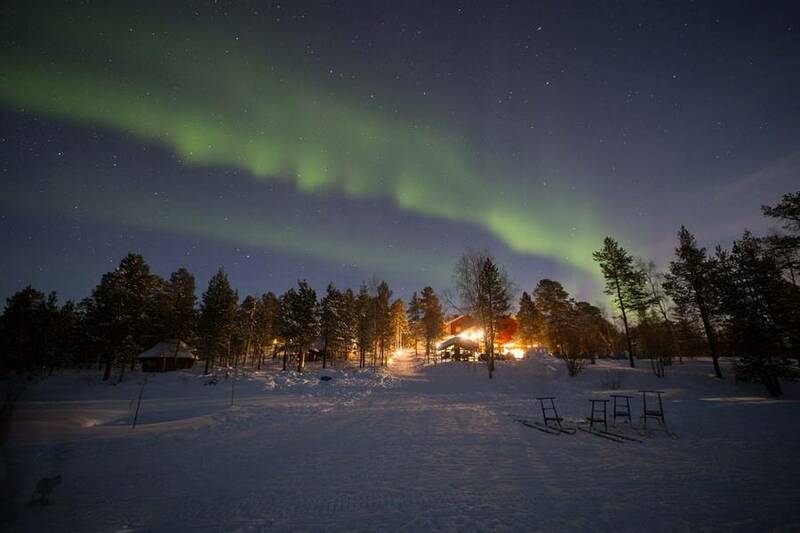 What's more, you will spend New Year's Eve snowmobiling and New Year's Day surrounded by reindeer – wonderful! 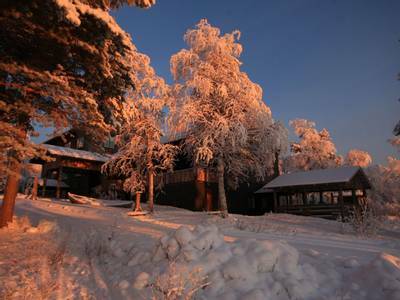 Welcome in the New Year in the spectacular wilderness surroundings of Menesjärvi during this four-night break. 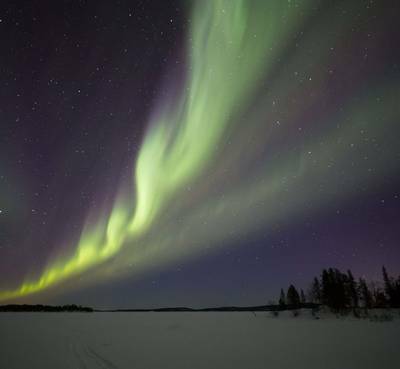 Enjoy unforgettable experiences such as a husky safari and snowmobiling as well as night-time searches for the Northern Lights. 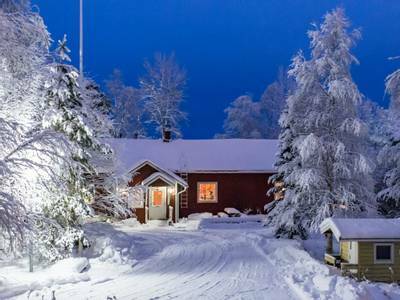 There can be few better locations for welcoming in the New Year than Menesjärvi. 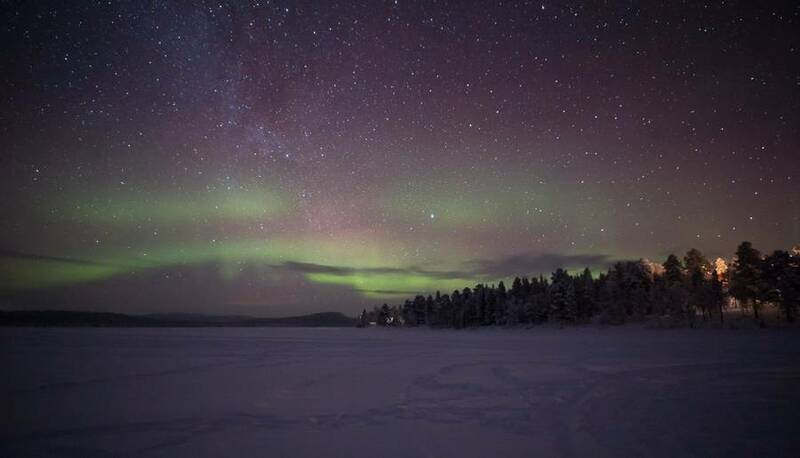 This is not a destination for those looking for lively nightlife but with its remote wilderness location, lakeside setting and lack of light pollution, Menesjärvi offers a wonderful sense of escapism. There is also huge potential to witness the region's own bright lights as the Aurora Borealis is a frequent guest here. Your four nights will be spent at Hotel Korpikartano, a hotel that brims with character and offers a warm welcome to all its guests. 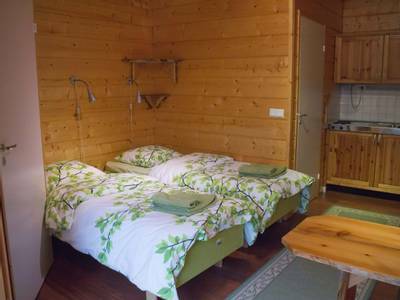 The accommodation is simple and cosy, providing all the essentials. The staff members here are wonderful and the location is incredibly special. As one of our active trips, this itinerary is designed to keep you busy during the day and at night. That said, you do also have some time to simply relax and tailor your four-night holiday. 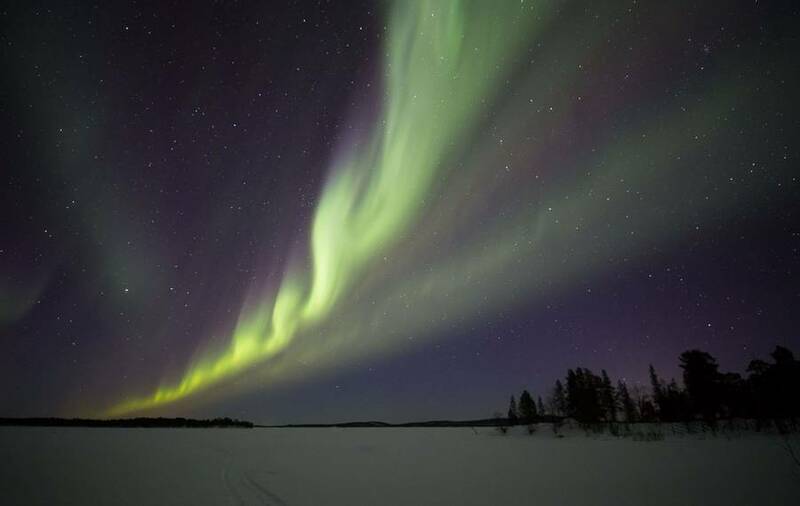 Highlights of the Northern Lights trip include a snowmobile ride to go ice fishing, a morning with a traditional Sami reindeer herder and a memorable husky safari in the Arctic wilds. 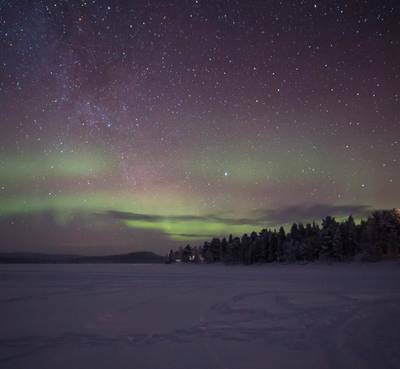 Your evenings will, of course, be spent seeking out the Aurora with a snowshoe walk, Northern Lights snowmobile trip and a special New Year's Dinner in a lakeside kota all included. 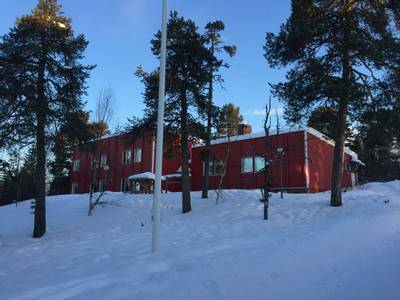 We love this location because it has everything a wilderness setting should have: endless snow-covered fells and forests, the vast expanse of frozen Lake Menesjarvi and absolute silence all around. This remoteness, not only ensures that you get a fantastic sense of peace, but also means that your chances of seeing the Northern Lights are excellent. Welcoming a New Year in this unique and remarkable environment is sure to be something you will never forget. 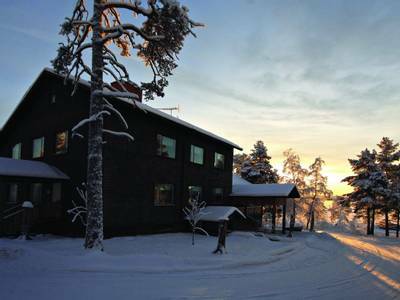 After landing at the airport you will be met by your guide before being transferred to the remote and picturesque community of Menesjärvi. As you drive through the wilderness you begin to appreciate what a remarkable location this really is, miles from the nearest town. 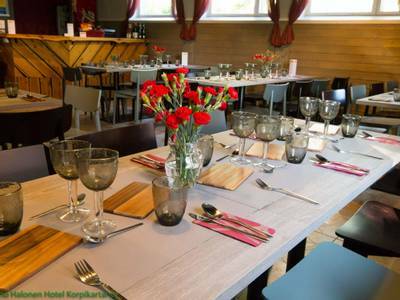 Upon arrival at Hotel Korpikartano, you will have the chance to settle in before enjoying a welcome dinner with the group. A brief introduction will be given on the hotel facilities and the final order of your activities will be confirmed. You can also get kitted out with cold weather clothing which you will keep for the duration of your stay. After breakfast this morning, you will explore the area around the hotel on snowmobiles. Before setting off, you will receive a full safety briefing and instructions on how to drive the vehicles. The purpose of your journey is to locate the ideal ice fishing spot on one of the frozen lakes nearby. Ice fishing is a much-enjoyed pastime in this corner of the world and if you are served fish at the hotel, it is likely to have been caught in one of these lakes. The guides will show you how to drill through the thick sheet of ice to reach the water below and from there the fun is in the anticipation. If you are not lucky enough to catch anything, this is still a relaxing activity which provides the ideal opportunity to spend time enjoying the silence and the surroundings. While snowmobiling, you will travel two people per machine with the opportunity to take it in turns to drive (providing you both have a full driving licence and are over the age of 18) or travel as a passenger. It is also possible to upgrade and drive one person per snowmobile. Details about this can be found in the ‘Personalise’ section. After lunch, this afternoon has been left free for you to relax or to try some additional activities. The hotel offers free use of kick sleds, snowshoes, toboggans and cross-country skiing equipment and so you can explore independently should you wish. There are maps available at reception and you should check the trail conditions and weather before setting off. Bear in mind that it will get dark in the afternoon at this time of year, so a head torch may be required. 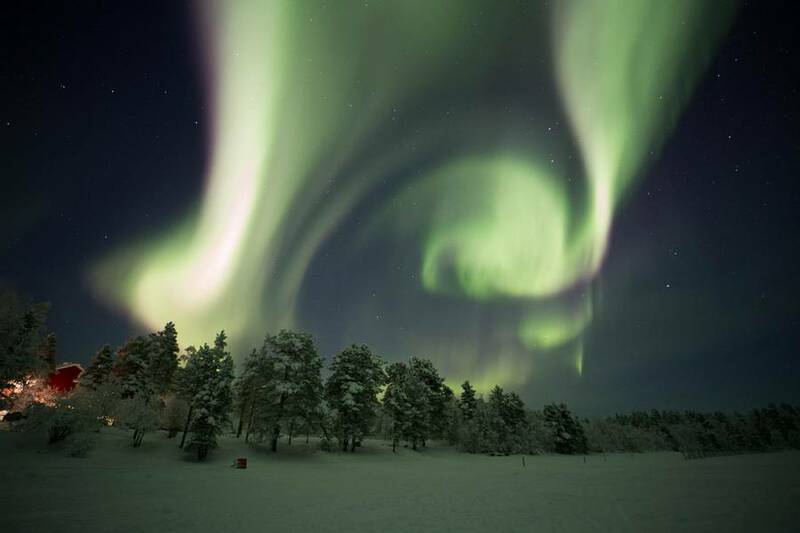 This evening after dinner, there will be an Aurora workshop led by one of the expert local guides. They are all talented and enthusiastic Northern Lights photographers and during the workshop, they will showcase their images and discuss some of the science behind the Aurora. They will also talk you through the camera settings required to capture a Northern Lights image before you practice outside during your first night-time excursion: Aurora snowshoeing. Reindeer herding is a hugely important part of life in Lapland and the Sámi herders play an essential cultural, economic and social role today as they have done for centuries. Following breakfast, you will be transferred to meet a local reindeer herder who will explain his life and work. 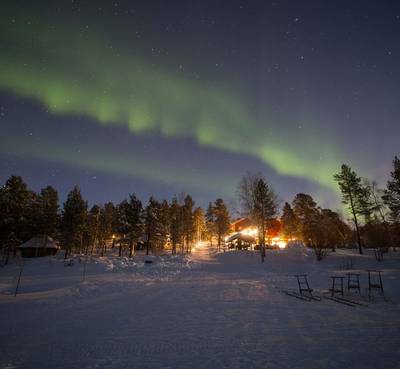 On arrival at the reindeer farm, you will travel out via a snowmobile-pulled sleigh in search of the herd. The reindeer will start to make their way through the trees, drawn by the smell of food and you will have the chance to observe them up close and to feed them. A campfire will be lit and you will enjoy hot drinks, as well as the opportunity to ask questions and discuss the herder’s daily life before your return to the hotel. This experience is not for tourists, you simply join the herder on their daily work; a really fantastic opportunity. After lunch this afternoon you will have access to the snowshoes, cross-country skis, kick sleds and toboggans at the hotel so you can explore independently if you wish. We have a special guided session of cross-country skiing that you can add to your holiday. Please see the ‘Personalise’ section for more information. 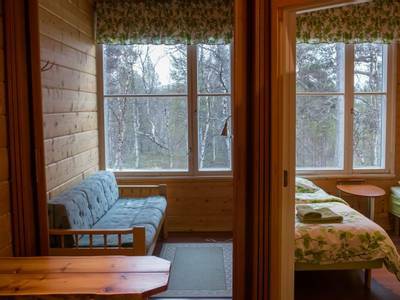 Alternatively, many guests enjoy making use of the sauna facilities at the hotel which can be booked in hour long slots each day for private use. This evening, you will gather with the other guests at the hotel to celebrate the start of a New Year in this amazing location. Dinner will be served in one of the hotel’s traditional kotas (wooden tepees). 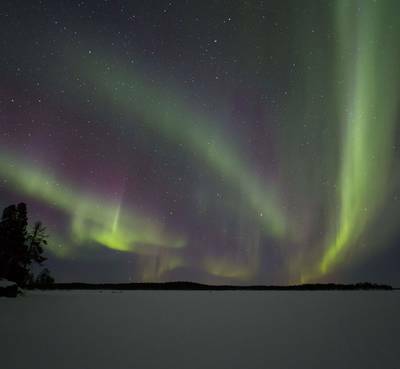 You can then all head onto the nearby lake to keep watch on the sky and see if the Aurora come and join in the celebrations. There are few better places we can think of to see in a New Year. After breakfast this morning you will take part in an exciting husky safari into the winter wilderness. After receiving full instructions, you will head out, two people per sled, with your team of eager dogs leading the way. Traversing the land in this traditional manner is a lovely experience that allows you to really enjoy the peace and tranquillity of your surroundings. We find that it is an activity which is almost universally loved by our guests. 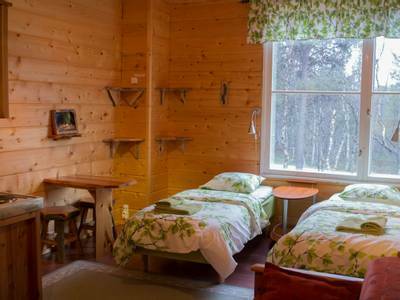 After your husky experience, you will then travel to the nearby village of Inari. 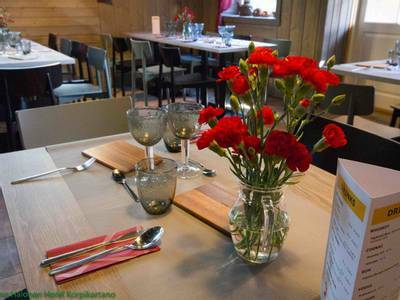 Here you will have lunch before visiting the main focal point of the village – the Sámi Siida Museum with its array of interesting exhibitions. Here you can gain an insight into the history of the region and the Sámi culture in general through the interactive displays and presentations. 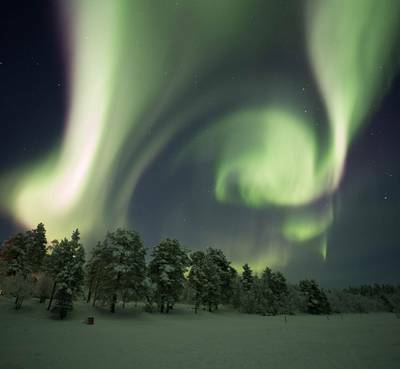 Tonight, after dinner, you will be back on the snowmobiles as you set off on an Aurora hunt, using the machines to provide you with additional mobility, which can be very helpful when seeking the Northern Lights. Your guide will give you a safety briefing and full instructions on how to drive the vehicles. The pace will be gentle as your guide leads the hunt, using their local knowledge and expertise to try and track down the Northern Lights for you. Once again, you will travel two people per snowmobile; the upgrade to travel one person per vehicle can be found in the ‘Personalise’ section. Anybody wishing to drive must have a full driving licence and be over 18. After breakfast, your adventure comes to an end as you are taken to the airport for your flight home. Cross-country skiing is remarkably good fun and is an efficient way to travel and explore the terrain surrounding the hotel. Gliding across a frozen lake or through a snow-laden forest helps you understand why people get addicted to this pastime. Your guide will give instructions and lead you through the forest on a short ski trip. The skis will then be yours for the remainder of the day should you wish to further enhance your skills. 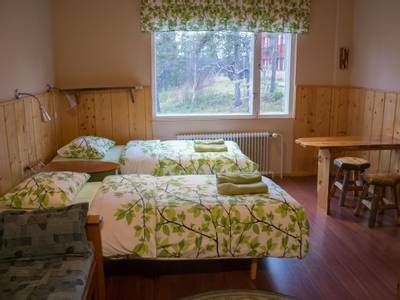 This is an excellent option for your first full day in Lapland. Wandering around on snowshoes is a classic way of getting around in Lapland, taking you into some truly quiet natural spaces. 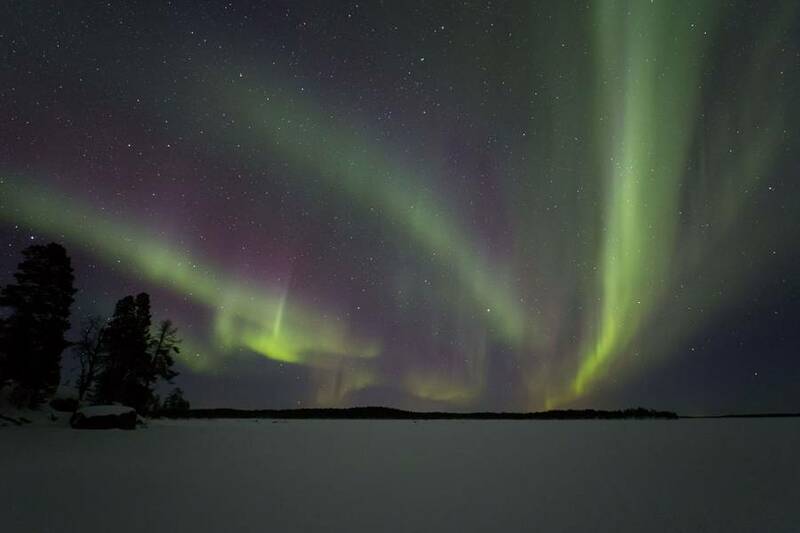 Why not add another to your holiday for an extra session of therapeutic walking, looking out to see if the Aurora are dancing in the skies above? Driving a snowmobile over the open whiteness is utterly electrifying, so it is well worth upgrading to drive your own snowmobile for the whole activity, rather than going two per vehicle. This holiday requires a minimum of 2 people to run, however, we require a minimum of 8 people for our flight allocation. Maximum 24 people (approximately). Please speak to our Travel Experts for further information. Read more holiday very special. Read more Totally fell in love with Finland - thank you - it was worth every penny - please pass on our thanks to all at the hotel. PS we didn't see the lights but awesome though they may be, this really didn't matter with everything else that we had to do, and it's left us with a reason to try again another time. I was so impressed with the attention to detail regarding my wife being gluten free, even when we were out on excursions she was well catered for. The husky sledging (favourite activity), the dogs were so friendly. We enjoyed helping set up our team and loved fussing them. We will remember this trip for the rest of our lives.